Convio is keeping a pulse on the nonprofit sector by measuring its successes and challenges. 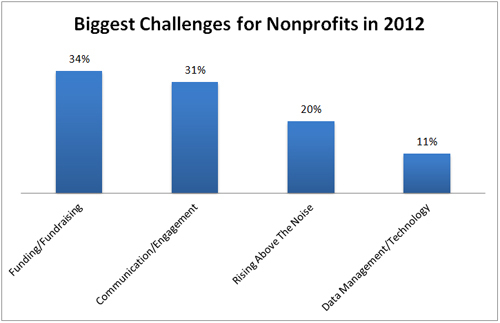 With the first quarter of 2012 in the rear view mirror, recent interviews conducted with 70 nonprofit professionals revealed four major issues of concern: funding/fundraising; communication/engagement; rising above the noise; and data management/technology. According to those surveyed, 34 percent identified fundraising as the biggest current challenge in 2012. In close second, with 31 percent of the vote, is communication/engagement. Fundraising is always top of mind: 34 percent of nonprofit professionals identified fundraising as the current biggest challenge for nonprofits, given that the economy is on the rebound and donors are much more selective about their donations. Which leads to the need to rise above the noise: 20 percent of those interviewed feel that there are many more nonprofits today than even 5 years ago, and the need to rise above the noise and differentiate the organization is critical. This means strategic communication and engagement is a priority: 31 percent of those surveyed identified effective communication/engagement with their supporters as something very vital for nonprofits in an age of donor fatigue. And the way to do this is through proper data management and effective technology tools: 11 percent of those surveyed identified technology and data management as a challenge that nonprofits need to understand and embrace to ensure success. Convio conducted interviews during Austin’s South by Southwest® Interactive Festival in March, as well as at the Nonprofit Technology Conference taking place in San Francisco earlier this month. The data is based on answers aggregated from both conferences. Convio is a leading provider of on-demand constituent engagement solutions that enable nonprofit organizations to maximize the value of every relationship. With Convio solutions, nonprofits can more effectively raise funds, advocate for change and cultivate relationships with donors, activists, volunteers, event participants, alumni and other constituents. Convio offers two open, cloud-based constituent engagement solutions: Convio Common Ground® for small- and mid-sized nonprofits and Convio Luminate™ for enterprise nonprofits. Headquartered in Austin, Texas with offices across the United States and United Kingdom, Convio serves more than 1,600 nonprofit organizations globally. Convio is listed on the NASDAQ Global Market under the symbol CNVO.